Recipe courtesy of Walnut Marketing Board. Mix oats and walnuts in 13x9x2-inch baking pan. Combine 1/4 cup of the maple syrup and butter in small heavy saucepan. Bring to boil. Pour maple syrup mixture over oat mixture; stir to blend well. Gently toss strawberries, peaches, blueberries, kiwifruit and remaining 3 tablespoons maple syrup in large bowl to blend. Divide half of the kiwifruit mixture among 6 parfait or wine glasses. Sprinkle each parfait with half the granola mixture, dividing equally. Top each with half the yogurt. Repeat layers. Serve immediately. 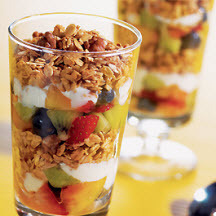 Tip: These delicious parfaits are an excellent source of vitamin C, folacin, magnesium and zinc. Nutritional Information Per Serving (1/6 of recipe): Calories: 273; Calories From Fat: 25; Total Fat: 8g; Saturated Fat: 1g; Cholesterol: 5mg; Total Carbs: 45g; Fiber: 5g; Protein: 9g; Sodium: 77mg; Potassium: 630mg. Recipe and photograph courtesy of Walnut Marketing Board.